Calm, Forward, Straight: In the Arena #43- Last ride of the year = best ride of the year! In the Arena #43- Last ride of the year = best ride of the year! Couldn't think of a better way to top off 2010! Gorgeous day, magical ride... I'm all smiles. Started the year not being able to get off the island for lessons... was kind of afraid of my horse after a confidence destroying trail ride. 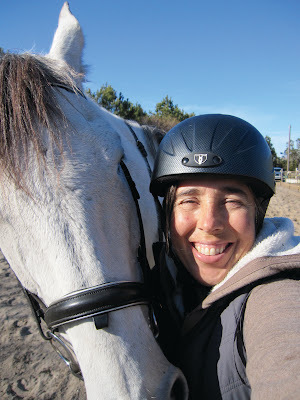 Spent a few months doing a lot of groundwork... getting to know my horse better, and truth be told, avoiding riding him. In March I finally made it to my trainers for some lessons, after a five month break. We lost our dear Virginia Dare to choke. Val got his new companion Cowboy. Things began to look up. April and May brought much more riding... more specifically riding with intention. Also there were barn improvements, helpful new tack (Le Trixerant girth) and our first outing the beach in half a year. June and July... hot, hot, hot.. wet and buggy. Evening rinses are a must. More lessons + Val gets a massage. August brought more lessons, Val a wind puff and Cowboy a snakebite, (how to learn horse triage in a hurry), more barn improvements and finding the motivation to ride when its insanely hot. Hurricane season is on the way. Oh yeah, and don't forget to count your blessings... I bought my farmette. One day I will get to live with my horse, but for now he has a permanent home. October and November brought the fruits of a regular training schedule - some really nice rides. Me and the horse are beginning to click. Also more lessons, a hurricane + evacuation for Val. A minor health scare which turned out to be sore feet. And the start of the yearly "will there be enough hay for the winter" paranoia. You've had a great year with more to come in 2011, I expect! I think riding regularly and, as you say, with intention, is a big part of successful riding. Sounds like a great year. Although the early parts weren't pleasant, look where you are now. Awesome. You give me encouragement. I absolutely believe that fear comes from the devil and not from God. I had developed a fear of my horse too but to give in would be, to me, like not trusting in God. I push through and I admire the way you have too! No better way to end the year and insure a positive start to the one than ending it on a good note. So glad your ride went so well and love the years recap. I may just have to do the same thing. You and Val have had a good year that can only get better next year. Glad you had an awesome ride today to top off the year. Sounds really good - here's to a similarly progressive 2011...! Having just found your blog mid 2010 it was interesting to read about the whole year. So glad you over came your bad experience with Val and are having a fantastic time with him. He's such a nice horse.